1 of 31 · The Porch of the Caryatids, six maidens holding aloft the southern portico of the Erechtheion sanctuary in the Acropolis. The Porch of the Caryatids, six maidens holding aloft the southern portico of the Erechtheion sanctuary in the Acropolis. 2 of 31 · The Porch of the Caryatids, six maidens holding aloft the southern portico of the Erechtheion sanctuary in the Acropolis. 3 of 31 · The Porch of the Caryatids, six maidens holding aloft the southern portico of the Erechtheion sanctuary in the Acropolis. Palace of St Michael and St George. 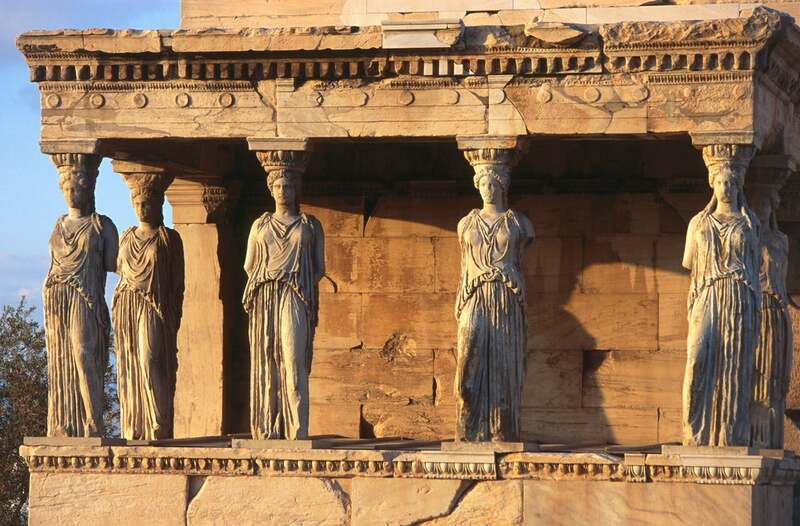 4 of 31 · The Porch of the Caryatids, six maidens holding aloft the southern portico of the Erechtheion sanctuary in the Acropolis. 5 of 31 · The Porch of the Caryatids, six maidens holding aloft the southern portico of the Erechtheion sanctuary in the Acropolis. Arch at Palace of Galerius. 6 of 31 · The Porch of the Caryatids, six maidens holding aloft the southern portico of the Erechtheion sanctuary in the Acropolis. 7 of 31 · The Porch of the Caryatids, six maidens holding aloft the southern portico of the Erechtheion sanctuary in the Acropolis. 8 of 31 · The Porch of the Caryatids, six maidens holding aloft the southern portico of the Erechtheion sanctuary in the Acropolis. The Stephanos Crater inside the caldera of Nisyros Volcano. 9 of 31 · The Porch of the Caryatids, six maidens holding aloft the southern portico of the Erechtheion sanctuary in the Acropolis. 10 of 31 · The Porch of the Caryatids, six maidens holding aloft the southern portico of the Erechtheion sanctuary in the Acropolis. Foundations of Philippeion Temple at Ancient Olympia. 11 of 31 · The Porch of the Caryatids, six maidens holding aloft the southern portico of the Erechtheion sanctuary in the Acropolis. 12 of 31 · The Porch of the Caryatids, six maidens holding aloft the southern portico of the Erechtheion sanctuary in the Acropolis. 13 of 31 · The Porch of the Caryatids, six maidens holding aloft the southern portico of the Erechtheion sanctuary in the Acropolis. Fortress walls and Athena temple at Acropolis of Lindos. 14 of 31 · The Porch of the Caryatids, six maidens holding aloft the southern portico of the Erechtheion sanctuary in the Acropolis. Palace of the Grand Masters. 15 of 31 · The Porch of the Caryatids, six maidens holding aloft the southern portico of the Erechtheion sanctuary in the Acropolis. 16 of 31 · The Porch of the Caryatids, six maidens holding aloft the southern portico of the Erechtheion sanctuary in the Acropolis. 17 of 31 · The Porch of the Caryatids, six maidens holding aloft the southern portico of the Erechtheion sanctuary in the Acropolis. 18 of 31 · The Porch of the Caryatids, six maidens holding aloft the southern portico of the Erechtheion sanctuary in the Acropolis. Fish stall at Athen's Central Market. 19 of 31 · The Porch of the Caryatids, six maidens holding aloft the southern portico of the Erechtheion sanctuary in the Acropolis. 20 of 31 · The Porch of the Caryatids, six maidens holding aloft the southern portico of the Erechtheion sanctuary in the Acropolis. 21 of 31 · The Porch of the Caryatids, six maidens holding aloft the southern portico of the Erechtheion sanctuary in the Acropolis. 22 of 31 · The Porch of the Caryatids, six maidens holding aloft the southern portico of the Erechtheion sanctuary in the Acropolis. The sanctuary of Athena Pronaia at Ancient Delphi. 23 of 31 · The Porch of the Caryatids, six maidens holding aloft the southern portico of the Erechtheion sanctuary in the Acropolis. 24 of 31 · The Porch of the Caryatids, six maidens holding aloft the southern portico of the Erechtheion sanctuary in the Acropolis. 25 of 31 · The Porch of the Caryatids, six maidens holding aloft the southern portico of the Erechtheion sanctuary in the Acropolis. The Holy Trinity Monastery (Moni Agias Triados) at Meteora. 26 of 31 · The Porch of the Caryatids, six maidens holding aloft the southern portico of the Erechtheion sanctuary in the Acropolis. 27 of 31 · The Porch of the Caryatids, six maidens holding aloft the southern portico of the Erechtheion sanctuary in the Acropolis. 28 of 31 · The Porch of the Caryatids, six maidens holding aloft the southern portico of the Erechtheion sanctuary in the Acropolis. 29 of 31 · The Porch of the Caryatids, six maidens holding aloft the southern portico of the Erechtheion sanctuary in the Acropolis. 30 of 31 · The Porch of the Caryatids, six maidens holding aloft the southern portico of the Erechtheion sanctuary in the Acropolis. 31 of 31 · The Porch of the Caryatids, six maidens holding aloft the southern portico of the Erechtheion sanctuary in the Acropolis.